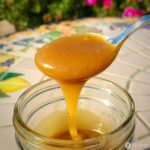 5-Minute Vegan Caramel Sauce? Yes, and it’s only 5 ingredients too! This plant-based vegan caramel sauce is truly delicious and comes together in a snap. The sauce is thick and full of richness, and no one will guess it’s dairy-free. I’ve made it with both cashew butter and tahini, and it really works both ways. The cashew butter gives this vegan caramel sauce a little more traditional flavor, tahini gives it a little twist and the sauce will be a little runnier. Of course, if you’re going the Paleo-friendly route, you’ll want to stick with cashew. Now it’s incredibly easy to add some indulgence to everything from apple slices to dessert, real food-style! Whisk all ingredients together in a small saucepan over medium heat. Once the mixture begins to bubble, reduce heat to medium low and cook for 5 minutes, whisking often. Remove from heat and allow to cool fully, stirring occasionally. Serve and enjoy! *Store unused caramel in a sealed container in the refrigerator for up to 1 week. This entry was posted in Dairy Free, Desserts, Kid Zone, Paleo Friendly, Recipes, Vegan. Bookmark the permalink.